A crave-able, delicious recipe, using grass fed lamb liver. Skeptical? You won’t be after you’re first bite of lamb or goat dirty rice, our take on the classic Southern dish, and one of our favorite ways to use lamb offal. If you didn’t know it contained liver, or whatever other offal you’d like to use, you’d probably have trouble picking out the flavors out from the toasted rice cooked in lamb broth, and savory creole spices. 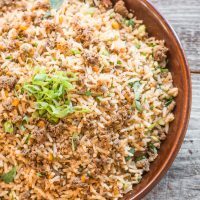 Traditionally, dirty rice is made with chicken offal, but here we use lamb, and, although the flavor is somewhat stronger than chicken, it still melts away into the flavors of the dish. 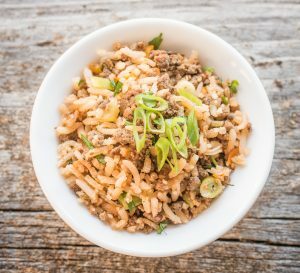 You might think our lamb dirty rice here as a side dish, or the foundation of a dinner or brunch entree, topped with a few sauteed vegetables, braised, and then browned lamb belly, and, or course, a fried egg. It’s also great made ahead, and reheated at a moments notice. Besides being a great foundation to all kinds of dishes, adding liver also adds nutrients to a dish, particularly iron. For people that need more iron in their diet, it’s hard to find a better source than liver. This recipe is by chef Alan Bergo. A chef from Minnesota, Alan is a 15 year veteran of the culinary industry, former executive chef of acclaimed Lucia’s Restaurant, and the Salt Cellar. 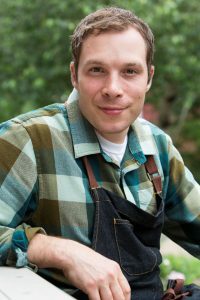 Founder of the website Forager Chef, he’s best known as a respected authority on Midwestern foraging. Learn more about Alan and his hunt for mushrooms, wild and obscure foods at Forager Chef. 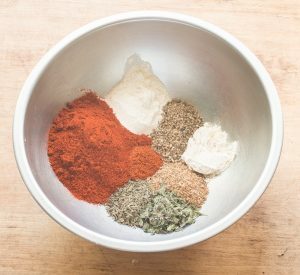 Our dirty rice features an easy-to-make creole spice mixture, designed by Chef Alan, but feel free to use your own favorite blend. Combine all ingredients, then transfer to a container, label, and date. The spice blend will keep for 6 months. Toast the rice until light golden in an oven, or in a pan on the stove using medium heat (optional). Cook the rice with 2.5 cups of water, 2 tablespoons of oil or lard, and 1 teaspoon of salt. From here the rice can be made ahead of time, up to 2 days. To make the lamb liver dirty rice, in a wide pan big enough to fit the rice, like a cast iron skillet, sweat the celery, onion, garlic, and peppers for 10 minutes on medium heat. Add the lamb liver, Cajun seasoning, 1.5 teaspoons of the salt and stir. Cook until the liver is done, then add the cooked rice, stir to combine well with the lamb and vegetable mixture, then double check the seasoning for salt or spiciness adjust as needed, then fold in the green onions and parsley at the last minute and serve immediately. The dirty rice re-heats very well, and is great with a fried egg. 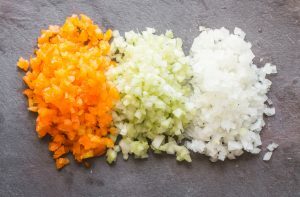 Onions, peppers, and celery is a classic building block of Southern Cuisine called the trinity.